The Industrie Palast project by Henning M. Lederer is an animated continuation of the 1927 poster "Man as Industrial Palace". The project explores the industry that is the human body, and all of the working bits that compose the greater 'factory'. 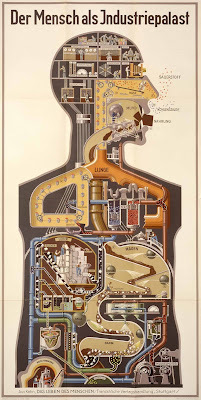 Lederer describes the body in 6 different cycles: Respiration, Blood Circulation, Digestive Circuit, Control Center, Metabolism, and the final synthesis - The Industrial Palace. We believe Mr. Industrie Palast to be eating chocolate - those wee sugar workers are working quite hard to fuel the muscle engine.